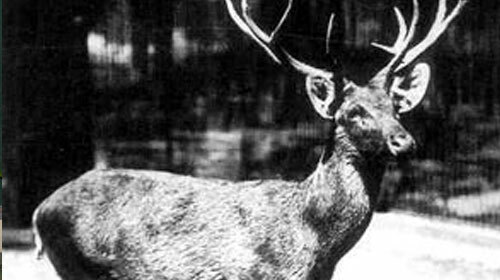 Schomburgk’s Deer was a species of deer native to Thailand and garnered its curious name from the British consul in Bangkok at the time, Sir Robert H. Schomburgk. This now extinct species of deer was first given a written description in 1863 by Edward Blyth. Although widely believed to be extinct and classified as such in 2006, some scientist believe there may still be surviving specimens out in the wild. Reasons for the extinction of Schomburgk’s Deer is largely down to human expansion and excessive hunting. During the 19th century much of Schomburgk’s Deer’s grassland habitat was transformed into rice paddies for commercial rice production. The combination of loss of habitat and excessive hunting, particularly throughout the year 1932 is thought to be the main reason for the extinction of Schomburgk’s Deer. The last specimen of this species held in captivity was slaughtered in 1938. Schomburgk’s Deer or Rucervus schomburgki was similar in appearance to the Barasingha and was a member of the Cervidae family. Schomburgk’s Deer were dark brown in color with a lighter underside and the males of the species boasted impressive antlers which could grow up to 40 inches in length. The females of the species could be told apart from the males by the fact that they did not grow antlers. The preferred habitat of Schomburgk’s Deer was that of swampy grasslands where long grass and cane was common. Generally Schomburgk’s Deer avoided dense woodland and usually travels in herds for extra protection. The herds of Schomburgk’s Deer usually consisted of a higher number of males to females and the young of the female members of the herd. It is thought that Schomburgk’s Deer became easy targets for hunting during the rainy season as they would be forced onto higher land elevations which could become islands in the intense rain, thus keeping the herds isolated with no where to run. Currently there is only one specimen in existence which is held in the National History Museum in Paris. In a strange turn of events back in 1991, antlers belonging to Schomburgk’s Deer were discovered in a Chinese medicine shop in Laos giving hope to the existence of at least and isolated population of Schomburgk’s Deer in Laos, however the Schomburgk’s Deer was killed on site so not much hope is held for the safety of the species if they do still exist.